Jax is 12 years old and a bit of a rebel, she's been in trouble for everything from shoplifting a candy bar to creeping backstage at a magic show to find the hole in the stage. Ethan is her sidekick. He knows he's a sidekick, he calls himself Caution Boy. But he just can't seem to walk away from Jax and her ill advised schemes. 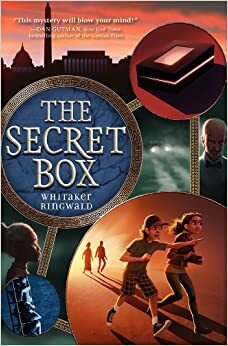 When Jax receives a mysterious box for her birthday from an Aunt she's never even heard of, she has to get it open no matter what. Unfortunately, the box has a special puzzle locking mechanism and apparently there are some other people who want to get their hands on the contents just as desperately as Jax does. Add in Ethan's truly obnoxious older brother Tyler as a driver and you have all the ingredients for an exciting and funny adventure. What I loved most about this book is the voice of Jax. She is so reckless and headstrong that you know she'll be leading us somewhere interesting and probably bad. Luckily her voice is tempered by that of fact-loving Ethan, who offers us a respite in tone and pace. Great for kids who love to be larger than life and who long for adventure.